Future first lady and Instagram queen Kim Kardashian has been forced to post a #CorrectiveAd on Instagram after she and a drugmaker ran afoul of the Food and Drug Administration over a deceptive ad. 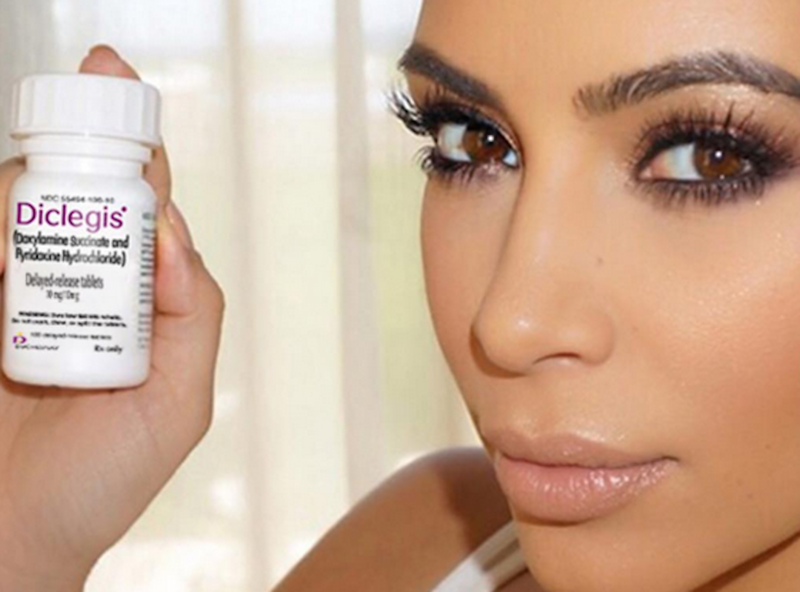 In now-deleted Instagram, Twitter, and Facebook posts, Kardashian touted the amazing benefits of a morning sickness drug called Diclegis, made by a drug company called Duchesnay. “The Office of Prescription Drug Promotion of the U.S. Food and Drug Administration has reviewed the Kim Kardashian Social Media Post for DICLEGIS (doxylamine succinate and pyridoxine hydrochloride) delayed-release tablets, for oral use submitted by Duchesnay, Inc. under cover of Form FDA 2253. The social media post was also submitted as a complaint to the OPDP Bad Ad Program. The social media post is false or misleading in that it presents efficacy claims for DICLEGIS, but fails to communicate any risk information associated with its use and it omits material facts,” says the FDA in a letter addressed to Eric Gervais, Executive Vice President of Duchesnay, Inc., dated August 7th. “OMG. Have you heard about this? As you guys know my #morningsickness has been pretty bad. I tried changing things about my lifestyle, like my diet, but nothing helped, so I talked to my doctor. He prescribed me #Diclegis, and I felt a lot better and most importantly, it’s been studied and there was no increased risk to the baby,” wrote Kardashian in her original Instagram post. Now, Kardashian has been forced to post a follow up ad – this time including the appropriate risk information. “#CorrectiveAd. I guess you saw the attention my last #morningsickness post received. The FDA has told Duchesnay, Inc., that my last post about Diclegis (doxylamine succinate and pyridoxine HCl) was incomplete because it did not include any risk information or important limitations of use for Diclegis. A link to this information accompanied the post, but this didn’t meet FDA requirements. So, I’m re-posting and sharing this important information about Diclegis,” she writes. The rest reads like any drug ad – a long list of warnings and possible side effects. #CorrectiveAd I guess you saw the attention my last #morningsickness post received. The FDA has told Duchesnay, Inc., that my last post about Diclegis (doxylamine succinate and pyridoxine HCl) was incomplete because it did not include any risk information or important limitations of use for Diclegis. A link to this information accompanied the post, but this didn’t meet FDA requirements. So, I’m re-posting and sharing this important information about Diclegis. For US Residents Only. Diclegis is a prescription medicine used to treat nausea and vomiting of pregnancy in women who have not improved with change in diet or other non-medicine treatments. Limitation of Use: Diclegis has not been studied in women with hyperemesis gravidarum. Important Safety Information Do not take Diclegis if you are allergic to doxylamine succinate, other ethanolamine derivative antihistamines, pyridoxine hydrochloride or any of the ingredients in Diclegis. You should also not take Diclegis in combination with medicines called monoamine oxidase inhibitors (MAOIs), as these medicines can intensify and prolong the adverse CNS effects of Diclegis. The most common side effect of Diclegis is drowsiness. Do not drive, operate heavy machinery, or other activities that need your full attention unless your healthcare provider says that you may do so. Do not drink alcohol, or take other central nervous system depressants such as cough and cold medicines, certain pain medicines, and medicines that help you sleep while you take Diclegis. Severe drowsiness can happen or become worse causing falls or accidents. Tell your healthcare provider about all of your medical conditions, including if you are breastfeeding or plan to breastfeed. Diclegis can pass into your breast milk and may harm your baby. You should not breastfeed while using Diclegis. Additional safety information can be found at www.DiclegisImportantSafetyinfo.com or www.Diclegis.com. Duchesnay USA encourages you to report negative side effects of prescription drugs to the FDA. Visit www.fda.gov/medwatch or call 1-800-FDA-1088. Of course, #CorrectiveAd or not, it’s still an ad. Probably a win for Diclegis.